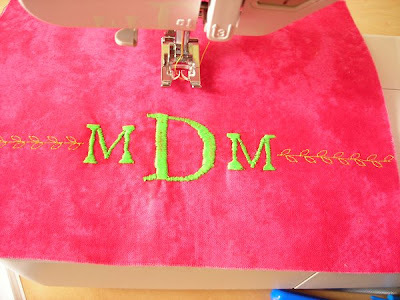 I wanted to specialize my yoga bag with my initials monogrammed on it, but I don't have an embroidery machine. Granted this isn't exactly as nice as I wanted my monogrammed letters to be, but it does scream "I DID IT MYSELF!" I could have done a much better job if I owned an open toe pressure foot which would allow me to actually see where the needle was going down next but considering this foot would cost me about $35 I decided I could live with my "N" foot and it does have an acrylic front which helps. 1. Fuse some interfacing to the wrong side of your fabric. I used lightweight, but heavy weight would have worked better if I'd had some. 2. Trace design to front of fabric - taping the design to the back and holding it up to a window should allow you to see through the fabric. Use disappearing ink or a water soluble ink. Yes, this works best if it's actually daylight outside, you can always hold it onto your computer screen or place it on a glass table top and shine a light under it. 3. Set your machine to zig-zag with a narrow stitch length and not too tight of tension and the desired stitch width. I set my machine to a stitch length of 0.4 with the tension on 3 1/2. For the width I found 5 to be a pretty good wide width for most of my design. I would vary the width as I needed according to my design the skinniest part being on 1.5 (less than that just didn't work well) and the max for my machine is 7 which I used for the wider parts of my letter. 4. I found it helpful to stitch the diagonal lines first then overlap them just a tad with a vertical or horizontal line. 5. 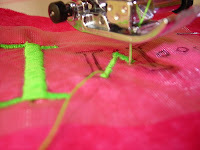 Take care to realign the center of your needle to the center of your design when changing the width of the stitches. Take your time and take extra-extra time on curves turning your fabric around a curve ever so slightly every couple stitches. 6. Leave threads long enough on the front to thread them through a needle and pull them through to the back side that way there aren't any little thread nubs sticking up on the front. Also thread them through often so they aren't in the way. That's about it. Like I said, it's not perfect but it's pretty cool and I did it myself! Just a note too: you can always just outline your design with one constant stitch width too.